In 1954, the year that Detroit was busily completing the Lodge Freeway and starting construction on the city’s other major highways Toronto (see pix) opened 12 stations on the Yonge Street subway line, the city’s first. Since then Toronto has built three more regional rapid transit lines, 69 stations, and nearly 43 miles of subway and rapid transit track. The city’s subway and surface streetcar system carries 1.2 million passengers a day, many of whom also use the seven commuter train lines into town. Only New York and Mexico City have a more extensive rapid transit system than Toronto. Detroit, meanwhile, has none. The contrast between the two cities in economic competitiveness, quality of life, and opportunity is just as stark. Detroit’s population, now less than 900,000, is less than half of what it was in 1954, when the number of Detroit residents peaked. The Detroit metropolitan region, where 4.8 million people live, has grown by roughly 100,000 residents since 1970. The number of vehicles, meanwhile, has increased by 1.6 million during the same period. Southeast Michigan has the highest rates of racial and economic segregation, joblessness, income stagnation, home foreclosure, heart disease, diabetes, and obesity of any major metropolitan region in the United States. Toronto, meanwhile, has steadily grown to a city of 2.5 million, and the population of the metropolitan region — 5.1 million — is nearly double what it was in 1970. 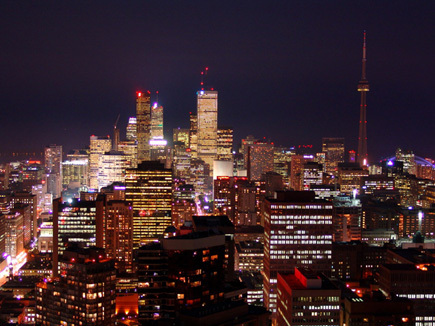 The largest city in Canada, and the fifth largest city in North America, Toronto also challenges New York as the continent’s most racially diverse and most prosperous. Improving the global competitiveness, quality of life, and environmental sustainability of Canada’s cities. Requiring cities to have land use and transportation plans that favor transit as the primary means of accommodating future travel demand. Providing funding necessary to maintain and expand Canada’s urban transit systems in order to accommodate population growth and to allow transit to attract a larger share of the total travel market. Providing increased mobility for people so that they can take advantage of the employment, educational, recreational, and many other opportunities cities offer. Improving air quality and, in doing so, improve people’s health and their ability to enjoy outdoor spaces and activities. Ensuring the long-term economic stability and environmental sustainability by reducing climate-changing emissions and reliance on fossil fuels. These, by the way, aren’t just hopeful words. Canada means what it says, and nowhere is it more visible than in Toronto. On June 15, Ontario’s Premier Dalton McGuinty announced that the provincial and federal governments are teaming up to spend $17.5 billion to modernize and build roughly 550 miles of rapid transit lines throughout the Toronto metropolitan region by 2020. It is the largest and most extensive metropolitan rapid transit investment in North America since New York spent $24 billion from 1982 to 1999 to modernize its aged subway and bus system. That investment helped to spur an economic and demographic revival that reestablished New York as a choice place to live and do business. Toronto already is a grand place. Its downtown is a hub of activity 24/7 with outdoor cafes busy well into the evening. Its suburbs, though jammed with vehicles, are a display of gleaming office towers set amid a natural and agricultural landscape that the provincial government is determined to conserve. One of the region’s land use plans calls for preserving 1.8 million acres of open space and farmland in the region; one million acres already have been saved. Detroit turned down a $600 million federal transit grant in 1976 and can’t agree even now on using $100 million in federal funds to revive a heavy commuter rail line between Ann Arbor and the central city. Toronto’s new transit construction plan, meanwhile, will reduce pollution, congestion, and travel costs in a world where temperatures are rising and gasoline is heading to $8 a gallon. If you were a young person, which city is more inviting?